Please note that this review is from a printed publication that is no longer published. If you would like to submit an up-to-date review please visit our Feedback page. Flexitable grids are 20cm squared number grids with horizontal and vertical channels. They are printed with lead-free ink on soft plastic which may be folded again and again without being damaged. They were invented by a teacher who wanted to help children to master the four basic principles of mathematics in an enjoyable and interactive way. The four grids, Addition and Subtraction, Multiplication and Division, 100 Number Square, and Fractions and Decimals are simple yet ingenious learning tools. They are both visual and tactile and they are useful for children of all abilities including those with special educational needs. They provide an enjoyable way for children to explore number patterns and to gain mathe-matical insights. 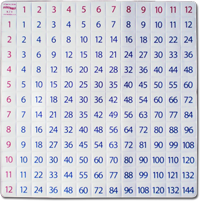 Each grid is supplied with teaching notes which are also free to download from the website. Flexitable’s website also has product reviews and videos showing the grids in use. John Dabell's TES review of the Flexitables.